A study guide for the Project Management Professional (PMP) certification exam, this book provides all the information project managers need to thoroughly prepare for the test. Review materials cover all the processes, inputs, tools, and outputs that will be tested, and extra help is offered with insider secrets, test tricks and tips, hundreds of sample questions, and exercises designed to strengthen mastery of key concepts and help candidates pass the exam on the first attempt. Andy Crowe is a certified Six Sigma Black Belt and the founder of Velociteach, a company that provides project management and certification training. He is the author of Alpha Project Managersand The CAPM Exam. He has taught classes in C++ for Microsoft University and advanced technology courses for the U.S. government and served on Microsoft’s .NET international advisory committee. He lives in Kennesaw, Georgia. 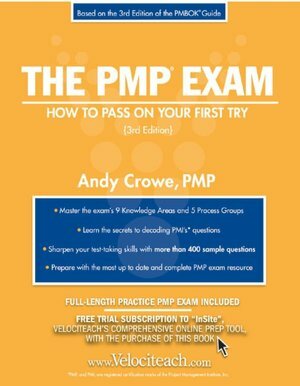 PMP Books PDF PMP eBook, PMP Exam. permalink.